Gavin Hood's Eye In The Sky treads around some very precarious moral issues with a deal of assuredness, which makes it all the more frustrating when the complex morals the film deals with don't quite receive the full payoff they deserved. 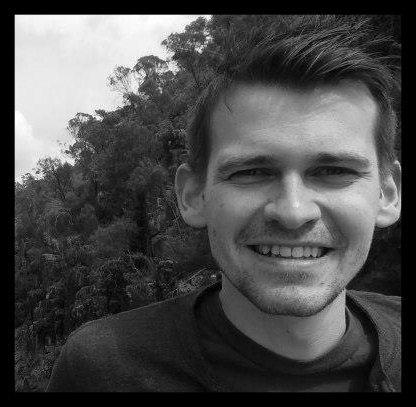 This is a film with a script savvy enough to reference YouTube without sounding as though it is a hopelessly lost tourist who does not speak the language of the country in which it resides, but which also, ultimately, cannot speak the complex language of the myriad issues with which it juggles. 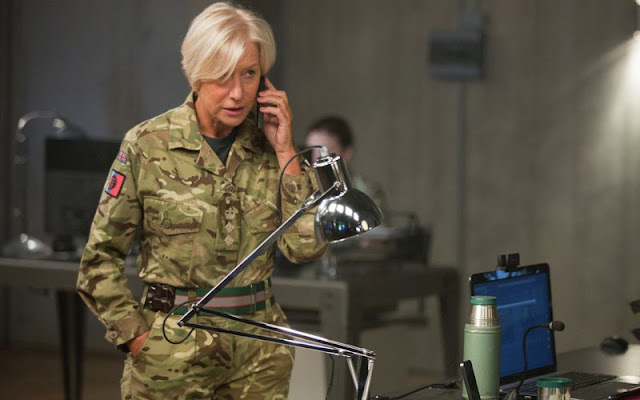 Guy Hibbert's slick script revolves ultimately around three female characters; a Colonel (Helen Mirren), one of her targets (Lex King) and the little girl (Aisha Takow) who may become collateral damage if the Colonel is able to execute her drone strike on said target. Involved in the discussion which develops are the pilot (Aaron Paul) who must pull the trigger, a General (Alan Rickman) representing the Colonel amongst politicians and an absent foreign minister (Iain Glen) with a serious case of food poisoning. The narrative beings with several subtleties in tact, though the ultimate problem with the film is that it cannot maintain them at that level. The General, for example, is shown in a lighter scripting moment to be purchasing a doll (Rickman's deadpan reading of the box - 'you will hear her babbling when it is time for beddy-bies' - is classic deadpan Rickman genius). At first the moment seems humanising and throwaway, until you realise a parallel is being setup between the child the General is in the process of treating and Alia (Takow), whose life hangs partially in the opines of the same man. It's similar to the parallel narrative of the Mexican cop in Sicario, with about the same level of 'success'. This draining of subtlety continues as the film progresses, right up until the concluding moments, when Hood opts against the option of ending without clear resolution and lays it on thick, right up until the over-credits scenes. The humanising of the military also begins to grate. The propaganda-like point seems to be to address Wikileaks-esque reveals, redressing the balance of the military as heartless killers of innocents with evidence that they think these sorts of matters of life and death through. The point is laboured in the extreme though the complexities of said point are not entirely lost; Mirren's character does clearly want the military action but her justifications are to do with reasoned argument, not bloodlust. The politics of the film though are decidedly military-centric; Hood himself features as a Colonel and one of the few voices urging caution out of liberality, rather than self-preservation (Monica Dolan) is given a Rickman tongue-lashing and then silenced. Not having the finesse to follow the morals through though, hurts the film more than if it had been less concerned with them. Man-behind-enemy-lines Barkhad Abdi has some tense scenes that are more successful straight Thriller. The chinking of Whitehall cutlery masks some sharp political insight. The very good though all becomes a little bit lost amongst Hood's direction, which is too respectful of some of his characters. There are arguably no real villains on screen for any definable time here, and that may well be the film's problem. Eye In The Sky was playing on TalkTalk TV Store.